How to approach family members who are “stuck”. 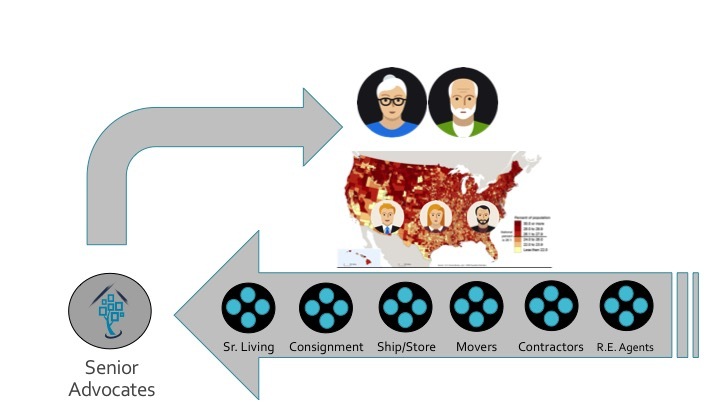 A transition late in life take a lot of organization because we are often reducing our household size, and depending on others to help us physically (and sometimes mentally) accomplish the change. While every situation is unique, there is an order to this logistical process that saves time and money. Getting all the stakeholder organized around a common methodology and Action Plan starts with a series of conversations. We recommend the Transition with Intent method for this highly emotional transition. Getting organized around goal or something positive to accomplish is the first step in planning a change. 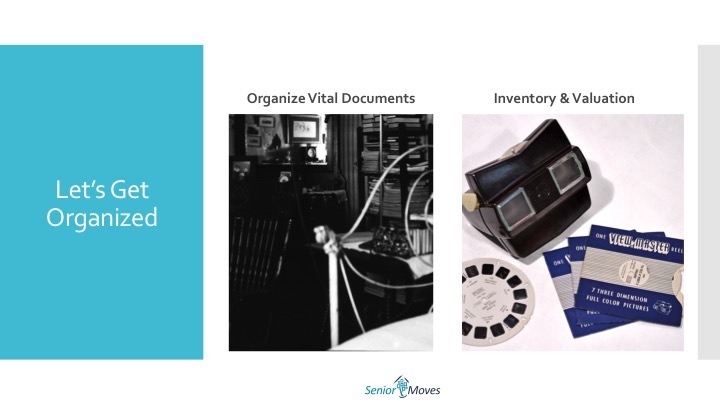 If you’re downsizing, you’ll need to know what you want to do before your know what you need to keep, what can be sold and what can be given away. We can guide you to tools that help these critical conversation so the family can get started and have appropriate input in a fair and equitable manner. Rightsizing is more than throwing away unnecessary junk that’s accumulated. 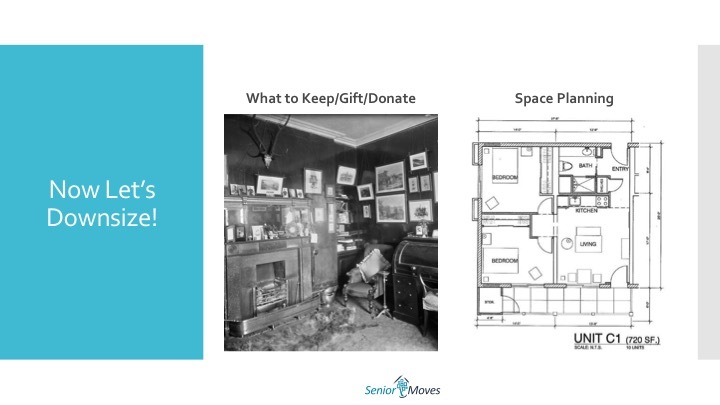 The key is planning how your stuff will actually work in the new living space. Start with what you need in life to accomplish the goals and lifestyle you decided on. Then add things that fit into the extra space. This is the appropriate time to think about safety factors as we age so prepare to ditch the throw rugs and make sure you have 36″ of walk space. There’s no reason to move things you won’t want or use. 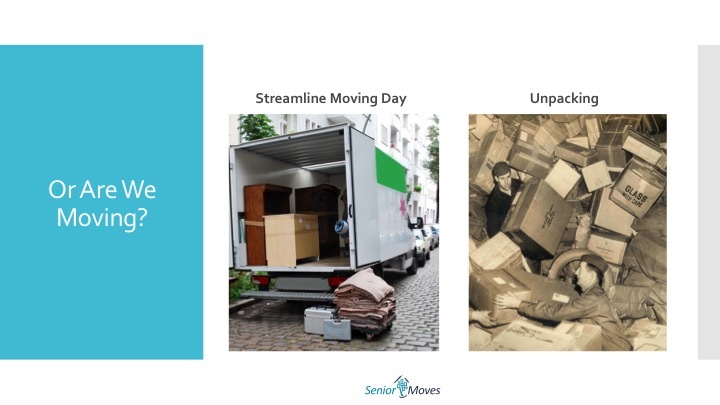 By organizing the right way, you created an easier, less expensive move and our Verified Professionals can take care of all the logistics of the actual moving day, unpacking, setup, and even post-move cleanup so you can take a break instead of breaking your back and sweat.